BELGIUM: The head of the lobbying group for the Belgian offshore wind industry has criticised government plans for a second offshore zone, claiming it would be too crowded. North Sea minister Philippe de Backer has announced the government will designate a new 221-square kilometre offshore wind zone close to French waters to increase Belgium’s offshore wind capacity from 871MW to 2.2GW by 2020, and 4GW by 2030, according to reports. But Annemie Vermeylen, secretary general of the Belgian Offshore Platform, told Windpower Monthly the new zone, situated west of the existing zone, falls short of the 400km2 that the group had requested to facilitate this offshore expansion. "We think the spatial component of this post-2020 development [will create] too high a project density, and that is not a good thing if you want the lowest possible cost per megawatt hour," she said. "We will see the impact of wake effect because it is a very dense zone." Wake effects, as a result of project density, was also the reason the industry gave when dismissing comparisons with the Dutch Borssele zones a year ago after a government report criticised Belgium prices as too high in comparison. Vermeylen also raised concerns that current grid facilities were not adequate to support expansion to 4GW, and thought it was unlikely this would change by 2020. In November, Belgian transmission system operator (TSO) Elia inaugurated the 47-kilometre, 380kV Stevin line that will transport electricity produced by new offshore wind farms to the mainland’s grid. Its 3GW capacity will enable it to connect part of the 2.2GW of wind farms planned for Belgian’s eastern first offshore zone, with a 150kV local grid absorbing the remainder. 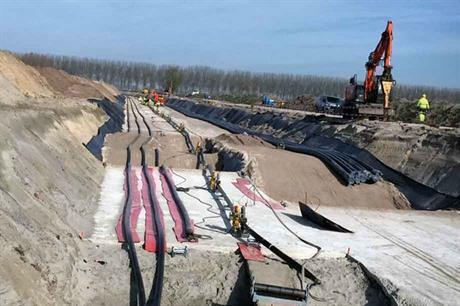 The Stevin Line will also facilitate the 1GW Nemo Link interconnector with the UK, which is under construction and due to begin operations in 2019, an Elia spokeswoman said. "The Belgian high-voltage grid will have to be strengthened if the government decides to increase offshore wind capacity," she added. The TSO is working on a development plan for 2020-30 that will be published at the end of this year.